The snow, ice and all that frigid weather is finally beginning to melt away and winter is finally behind us. The weatherman is predicting more April snow, but April snow melts in a few hours because the weather is warmer in April. Since the weather is starting to get warmer, IT’S AN APPROPRIATE TIME TO PLAN A PARTY! For that party we ask that you consider one of our very popular custom party theme lighted decorations. 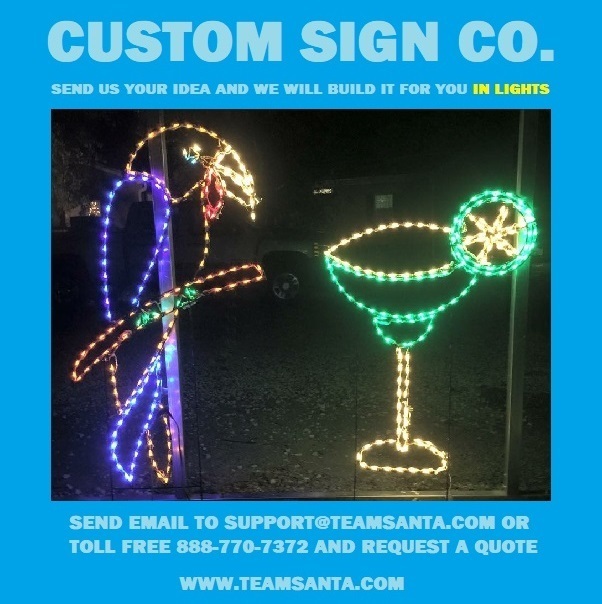 If you have an idea for a special lighted decoration, send your information to support@teamsanta.com for a fast-online quotation. Don’t forget to include photo of the item or a drawing of the same. We want to make sure we know exactly what you want before we make it. Allow approximately 2 weeks for delivery by FEDEX. Please take a look at the photo at the top of the page. The LED lighted parrot decoration and the LED lighted martini decoration. We made this adorable set of decorations for a lovely couple in Miami, Florida. I think it was just last year. I’m not sure. All I remember is that these two lighted decorations were custom made for this customer and the customer was so happy they sent us the above photo, so we can see them in action. It’s a funny story, the wife is very much interested in parrots and other exotic birds, while her husband is a connoisseur of different types of martinis. They are two very nice people and the project was a success. The photo shows the two lighted decorations on display right outside a sliding door at the couple’s home. Do you have an idea for An LED lighted sign? Do you want a sign made for the holidays, custom made just for you? Send your idea to support@teamsanta.com. We stop taking orders for custom order signs on September 20, 2018 so we can focus our resources on Christmas and other holiday decorations. I dropped by today to show you the lighted parrot decoration and the lighted martini Glass decoration (photo top of page). I will be back tomorrow with another example of our custom LED lighted signs, built by the Custom Sign Co. Until that time, Happy Decorating! Email support@teamsanta.com or call toll free 888-770-7372 and request to speak to a representative. Custom Sign Co.